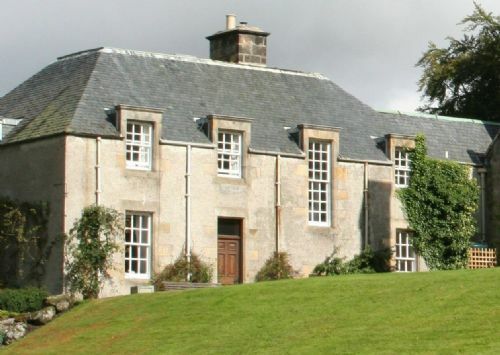 North Wing is an attractive, comfortably furnished two-storey wing with access to the grounds of Alvie House and Loch Bourne. Upstairs are 5 bedrooms, (double, 2 twins & 2 singles) & 2 bathrooms. Downstairs is a large kitchen with breakfast area, separate dining room & large living room with open fire, TV, DVD player, CD player & Wifi. There is also an additional WC on the ground floor. Laundry facilities are available in the basement of Alvie House. All linen is provided (except towels). Our family's third visit to the estate and our first time staying in North Wing. A lovely old building in beautiful surroundings. Heidi the housekeeper was very friendly and helpful. The house itaelf was warm, comfortable and perfect for two families with young kids. We will certainly be back again! Thank you! A great holiday in the Highlands. On arrival the youngest member of our group said “oh it’s creepy”and from the out side at rear of the property it looked a little in need of some repair work.Inside the carpets and furniture were old but the house turned out to be anything but” creepy”.It was light and spacious with interesting features,the bedrooms were clean and comfortable,which applied to the whole house.It was a great place for the family to meet up where we could spread out or come together in the ample space downstairs.A great location with plenty to do within a very short distance.A really enjoyable holiday with everyone agreeing they would love to return. A character full home to base yourself from in the beautiful Cairngorms National Park with plenty to do nearby. Accommodation is comfortable and ample space for medium to large groups with all you could need on offer. We had a great weekend and I felt it represented true value for money. A very welcome return to our daughter’s wedding venue. Accommodation first class, nothing too much trouble . Hospitality way over and above expectations. Thank you so much. We will be back ❤️. Love Alvie. Have been coming on and off for over 30 years. Great place for all ages. Wonderful welcome very comfortable accommodation for both family and dogs. Great place. North Wing Alvie House: A very special place. It was just as we remembered it. Due to family circumstance we had not returned for some time. The North Wing welcomed us back, perhaps it could be said with an element of 'tired-elegance'. Wonderfully comfortable and spacious, we love the sociability of the large kitchen. Eight adults are accommodated easily without bumping into each other all the time. It was a bit hot in the main bedroom at times, and albeit it was October, we had to have the windows open much of the time. Little hardship!! We enjoyed our stay in the wing of Alvie house very much. The area of Kincraig is so beautiful. We had a family get together and others stayed in the top flat. The house was warm with lots of hot water and a lovely new bath/shower room had been recently fitted. On dull days the log fire was cosy with lots of dry logs to use. We didn't want to go home. Our 20 plus year staying here. Do I need to say more? Everyone very friendly and helpful, accommodation perfect for a week of walking and cycling in the beautiful Highlands. Already booked for next year. There every year, for 10 years. If it's the kind of break you are looking for, then you won't find a better place/deal. We go every year, we love it and will continue to go every year. Best price out there by far for what you get. Lovely place to stay; very warm and welcoming. It is an ideal place for get together of extended family - we used the top flat as well and had space - and hot water - for seventeen. I am already looking forward to coming back next year. We spent a long weekend in the North Wing with our three small children in July. The accommodation is gracious and spacious. It's not luxury but it is clean and comfortable, relaxed and homely. We enjoyed free roam of the wonderful grounds and the children adored exploring our wing, finding nooks and crannies to hide in and playing in the gardens. There is loads to do nearby. We hope to visit again soon. This is our home from home! We never tire of returning to Alvie. The North Wing is full of character and we particularly enjoy the large living room with it's open log fire. The large kitchen is also brilliant with it's large seating area. Stayed here often, usually with friends, this time we took family members. Every one enjoyed the stay and will be back next year. A superb location for a truly comfortable and relaxing get away. Walking on the hills above the house looking for mountain hares and watching as the hills emerge from the mists in the valley was one of our most memorable days. If you are looking for a very quiet, relaxing place to stay I would highly recommend Alvie House. Our family spent three nights in the North Wing of Alvie House and loved the peace and tranquility of this beautiful estate. There were eight of us, five adults and three energetic children aged 9, 6 and 1 year. Very safe for the children who loved the estate as much as we did. We were very well catered for and found the house warm, welcoming, clean and tidy. I would not hesitate in making a recommendation. The North Wing is a comfortable part of a large country house. Alvie is a great base for an active holiday with many things to do on the estate as well as locally. The 2 km Alvie zip wire system is very popular - book ahead. There is riding on the estate and sailing on Loch Insh. We used a great butcher - Gow's - in Kingussie and Alvie raspberries are delicious. South down the A9 is the Dalwhinnie distillery (we booked for the tour) and serious retail therapy at the House of Bruar. A lovely old manor house in the Highlands with great character. The servants' call board in the hallway reminds of the time when this house wes built. Plenty of room for a large family (we were seven). Whilst the kitchen is modern and fully equipped, the bathrooms retain an antique charm with bathtubs only - no quick showers for the landed gentry. Comfortable beds, but the years have not been kind to the sitting room furniture. The location - just a few kilometres from Aviemore - is perfect for exploring the Central Highlands. Highly recommended as a characterful alternative to more mundane accommodations. We had a terrific weekend. Location of the house is very special and there was so much space inside and outside. My only criticisms are that the beds are a bit tired and uncomfortable, same with the sofas! However we didn't sit down too much as there's such a lot to see and do nearby. I would love to book again, but feel free to buy better mattresses! Some family members missed a good shower, but the baths were a nice alternative. Thanks to the housekeeper for her warm welcome too. Most enjoyable stay weather mixed but plenty to do. Heating excellent and facilities spot on. The staff could not have been more helpful. All in all I would thoroughly recommend the facilities to anyone. It was an excellent weekend. Not much to put wrong with the place or the location. I'd highly recommend this place to anyone as it's extremely quiet/private and has amazing views. It's not far into Aviemore either so easy to get supplies. We have been coming for over twenty years. Suits us perfectly. We walk, cycle, ski and enjoy all the facilities that the Estate offers. For us it is a home from home. As usual we had a great week at Alvie. Accommodation again superb, spacious and very warm indoors due to the central heating being so strong, but some of the windows need repair to avoid drafts. We have just returned from our tenth stay in the North Wing. It is a wonderfully comfortable home in the middle of a lovely estate and very convenient for a tremendous variety of holiday activities. I think this makes a great venue for any time of the year. Of course we will be returning next year! Amazing house, amazing owners and we go every year. Great value for money if you can get a full house. My huskies go every year and it's perfect for them too. Will be booking for next year soon. This is a lovely property, very well equipped, comfortable, and warm. The surroundings are beautiful and it's very quiet whilst being accessible from the A9 to Kingussie and Aviemore. The staff are outstanding and there are plenty of activities on-site for all ages and interests, as well as local attractions. The heating system came from some form of wood burning unit outwith the house and we had no control over it. It had to be either off or on and the rooms got very warm. Even if we turned the radiators completely off the pipes round the rooms still got hot. Even at night the heating was still on. The only other thing about our stay was that there was no contact from the people running it. The door was open and we had to leave the keys in the door when we left! If I had not needed to visit the Estate Office to ask something, we would have had no contact with anyone! No one asked us if we needed anything. My wife and I stayed for a week in the house, with friends coming and joining us during the week. The accommodation is excellent, with everything that we could have needed, and the house owners could not have been more helpful and friendly. We really enjoyed the family home feel of the house, without too many flashy trimmings, and masses of hot water and drying space for overcoats. Our friends took a few seconds to become acquainted with the naturally peaty hue to the tap water in the Highlands, but after a photograph, found the bath water extremely pleasant! We have already recommended it to others. We have been returning to Alvie either just as a family or with friends for the sole reason that it remains our home from home. Wecoming + beautiful! We had a great stay! It was lovely and clean, plenty of room for everyone. The only concerns was we overlooked that you needed to provide your own towels (as we travelled from Australia, it was not something we packed). There was also no shower and the pressure/temperature was not consistent. The house was fantastic will lots of room for all 8ea of us up for a family wedding will recomend to friends and family. Only minnor issue is that there is not a real shower and the bath water was not nice. Thank you for taking the time to submit your review. We are sorry that you experienced a problem with the water & thank you for bringing it to our attention. Alvie Estate is on a private water supply which is filtered/UV sterilised as required & it is tested regularly by Highland Council to ensure it is up to standard. We have found in the past that when we have wet weather, following a long dry spell, the water is often a darker colour (caused by the peat) & does sometimes contain particles of sediment that gets through the filters although the water is still perfectly safe to use. This is more prevalent if the property has been empty for a few days. The filters are changed regularly but we are not able to change the colour of the water. With regard to your other comment we are currently considering either replacing one of the baths with a shower cabinet or installing a shower cabinet in the downstairs cloakroom. Hopefully this will be done before your next visit. Meanwhile we are glad to hear that you all enjoyed your stay with us & that you will recommend us to family & friends. Spacious and warm, well equipped and with good facilities. We booked it in conjunction with another flat in the same building and it proved an excellent base for our large party. We have been coming here for 20 plus years, before children and with children. It is perfect for the whole family and we love it. Beautiful surroundings and very comfortable. Always walking/cycling and possibly skiing. So much to do for everyone. This year we tried the Zip wire and the Quad biking. Excellent. Would thoroughly recommend this. Great for the whole family. I have been staying in the North Wing for a week in February for the last nine years. It is an excellent venue for a gathering of friends or family. It comfortably sleeps eight in pleasant bedrooms and has a large kitchen and living room that are both great socializing areas. The log fire in the living room helps to create a brilliant atmosphere, particularly on cold and windy nights! I can see us using Alvie House for many years to come.